In the wake of the raid on a raw milk drop point in Austin just before Memorial Day Weekend (pictured at right), we’ve received many questions about what happened – and what happens next. Farm and Ranch Freedom Alliance stands behind the raw milk farms and the customers who have set up legal group distribution points. The recent raid appears to be due to a combination of an industry complainant and “rogue” bureaucrats. If government agents visit your home, you have legal rights and can choose how to proceed. Texas allows the purchase of Grade A raw milk only when purchased directly from the farmer at the place of production. For years, raw milk customers have cooperated to pick up each other’s milk and save a lot of time and gas – benefiting us all by reducing vehicle miles, traffic, and air pollution from unnecessary driving. This recognition of the legality of the consumer groups represented a reversal of the agency’s previous claims – and thus a recognition of both the legal soundness of our position and the growing political support for raw milk. There is a longstanding legal doctrine under which any individual (the “principal”) can hire anyone else (their “agent”) to do anything that the principal could legally do. Based on that legal doctrine, and consistent with DSHS’s email acknowledgment that people could pick up milk for each other, several consumer groups hired couriers to act as their agents and pick up their milk. There is no reasonable legal argument for DSHS to say that although individuals can pick up milk for each other, they cannot hire an agent to do so. However, couriers for customers of a licensed farm were stopped by DSHS agents twice in a seven-week period. The first incident, in the Houston suburb of Katy, occurred April 9 and resulted in a warning letter being issued against the farmer, but customers were allowed to take possession of their purchases. 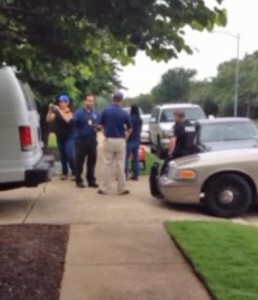 A few weeks later, on May 26, DSHS requested the assistance of Austin/Travis County Health and Human Services agents PLUS the Austin Police Department to confront customers at a southwest Austin residence. The customers were not allowed to take possession of the milk for which they had paid, and the government agents interrogated not only the driver but also the mom who had organized the group as a volunteer. Read more about the May 26 event here. We filed requests under the Open Records Act to obtain copies of DSHS and City of Austin documents to determine the source of this unjustified crackdown on raw milk sales. We obtained legal representation, with financial support from the Farm-to-Consumer Legal Defense Fund, for the farmer and for the Austin courier who officials claim is illegally running an unlicensed retail operation. We have had numerous meetings and phone calls with DSHS and have met with State legislators whom we know to be sympathetic to this cause. We alerted more than 10,000 people via email and social media about the events and asked them to contact their legislators to encourage an end to the harassment. We will continue to pursue all avenues to receive justice for the farm, its customers, and the couriers whom the customers hired. 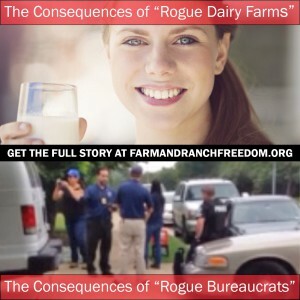 “Rogue group of dairy farms?” It seems to us that the problem is “rogue bureaucrats” who are ignoring real health problems – such as inspections of fast food joints – in favor of targeting people who are seeking out natural, unprocessed foods. We have received many calls from raw milk customers who are understandably worried about the police showing up at their doors. We encourage everyone to recognize that the industry and bureaucrats hope they can intimidate and harass people into giving up. Please don’t let them succeed. From the copy of the complaint we obtained, it’s clear that the complainant – and possibly others – is searching online for information about drop points so they can file complaints and give the agencies the excuse to harass more people. So please avoid discussing raw milk pickups while on publicly accessible internet venues. That includes not only Facebook, but also Yahoo groups and neighborhood social networking sites. Again, we believe that these arrangements are legal. But every time one is “busted,” consumers are seriously inconvenienced, the farmer loses money, the courier loses money, and we spend more time and resources fighting for justice. It’s better to avoid the problem until we have a clear resolution on farmers’ and consumers’ legal rights, and have figured out how to prevent the harassment. Decide whether you will demand a warrant. The government either needs a warrant or your permission to come onto your property. You can invoke your Fourth Amendment right against unreasonable searches and seizures to tell government agents to leave your property. Deciding whether or not to allow the government on your property is a difficult decision to make. On one hand, you may want to assert your rights. On the other hand, playing hardball can make a situation escalate. Decide ahead of time what you want to do so you don’t have to make the decision under the stress of the moment. The Farm-to-Consumer Legal Defense Fund has an excellent article on its website explaining the options, as well as what to do if you demand that they come back with a warrant and they do so. The government also has no right to obtain any documents from you – whether it is the agency agreement, a list of the names of the people involved, or any other document – without a warrant that specifically describes those items. Don’t give statements or sign anything just because they tell you to. Even if you allow them on your property, you do not have to answer questions. If you have any hesitancy about what you want to say, then stay quiet. If the government official asks questions that you do not want to answer, you can simply say you refuse to answer. If they continue to press, ask “Am I in custody?” If the answer is no – as it absolutely should be – then you can tell them you want to leave or that you want them to stop asking questions. One option to consider is to be prepared with what you want to tell them, and stop there. For example, you may choose to provide your name, the fact that you are buying from a licensed farm, and that you (not the farmer) have hired a courier to act as your agent, and then stop. Or whatever it is that you think best: it is your choice what to say, including whether to say anything at all. The government also has no power to demand that you sign anything. In both the April and May incidents, DSHS staff wrote incorrect information on the inspection report and then told the couriers to sign. Do not sign anything unless you have read every word and are certain it is accurate. Otherwise, you can simply say you don’t want to sign it. You have the right to have a record of what the government agents are doing. Got a smart phone? Turn on the video recording. Take pictures. Bring out an audio recorder to capture what is being said. Just remember that you cannot physically obstruct government agents’ activities. Getting recordings and pictures will not only protect you, it helps us make sure that any government abuse is brought to light afterward. Please share any images or recordings with us at info@FarmAndRanchFreedom.org. Whether you drink raw milk or not, this situation poses a simple question: Can the health departments ignore fundamental principles of law and individuals’ basic legal rights, and re-interpret regulations simply because they think you shouldn’t be eating or drinking something? Not only do the agencies’ actions threaten raw milk farmers and consumers, but we believe that this very well could be the start of a broader campaign against both raw milk and local food distribution options. Write or call your state representatives to let them know where you stand on the right to purchase raw milk and the need for individuals to be able to work together to rebuild a local food system. Your words mean more than anyone else’s, so tell your story! And remember that your stories are important to your raw milk farmer, too. Share your letters and emails with your farmers and with us. This has been an unsettling time for all the raw milk providers, and they need to know that we support them in this battle. We’ve provided sample emails on our website to assist you. Thank you for supporting Texas’ independent farmers!